Hi friends! I’m way too tired & cranky to do any more work this afternoon — the project I’m wading through has pretty much sapped the life out of me for today — so I figured I’d do something semi-productive and write a blog update. I’ve been meaning to put out some news for at least a week now but never quite got around to it. So here’s some random stuff about my life at the moment. Grandma is doing surprisingly well. Despite the lung doctor’s pronouncement that she has two to three months to live, we’re still not seeing any change in her condition. Of course, that may not mean anything, but we’ll take whatever good news we can find. I’m particularly relieved since we’re almost out of September and (dare I say it?) no hurricane threats yet this year! Once we hit October, the threat level goes way down, so I’m feeling pretty secure that we won’t have to evacuate this season. Last year’s evacuation ahead of Gustav was just grueling — by far the worst I’ve ever been through — so it’s a huge blessing to think we won’t have to do that again any time soon. Overall, I’m doing better health-wise. The new medicine is working, and between that and higher quality vitamins, I’m feeling better, being more productive, and not needing quite so much sleep. As a result, I’m watching a lot less TV and reading more — both big goals of mine for this year. (I’m currently reading The Black Company by Glen Cook and being pretty darn impressed by his attention to detail.) I’m trying to start easing into creative writing again but haven’t made much progress yet; I did some short fiction exercises one day last week and never got back to it. I guess that would have been a good thing to do instead of this blog entry, wouldn’t it? Oh well. Maybe another day. The choir situation has improved. I’m much less frustrated with our new director and I’m no longer thinking about quitting. So that’s good. Which is not to say that I’m totally happy — we’re taking part in a choral concert next month and we still don’t know what our second selection is going to be; our original choice got scratched because we don’t have enough time to learn it. Oh, and I don’t really like the piece we’ve been rehearsing so far. But you can’t have everything, and I’m mostly managing not to get too worked up when things don’t go quite right. 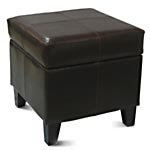 I have a new toy: an adorable faux-leather storage ottoman I ordered online from Wal-Mart. It’s actually really nice and a steal for $35 + tax. (The picture is from their website, since I’m feeling lazy.) So now I have someplace to prop my feet up when I’m reading! (I’m convinced that I’d read more if I had a comfier reading setup.) And having the storage compartment is just great — clutter drives me nuts, and this way I can hide all DVDs and CDs in the ottoman and still have them close at hand. Win-win! Okay, I think that’s about as interesting as I can be today. Further bulletins as events warrant or as the mood strikes. Isn't it cool to find something new? You're absolutely right! I tend to get stuck in familiar ruts, so it's very exciting for me to discover something new that I really like. That ottoman looks really cute!